The definition of Recruitment Marketing is the practice of promoting the value of working for an employer in order to recruit talent. Recruitment Marketing is a new HR discipline that uses digital marketing strategies to give employers a competitive edge in attracting and engaging quality candidates through search, social, mobile and email. Today’s candidates discover and consider employers the same way consumers find products, hotels and restaurants. Through searching online, following social media and reading reviews, candidates can become aware of an employer and its career opportunities. What they learn about a company’s mission and culture can influence a candidate’s decision to apply for a job and accept an offer for employment, or form a negative perception and become a brand detractor. Given the parallels between candidate and consumer behavior, the disciplines of Recruitment Marketing and Marketing have many similarities: skills like branding, messaging, engagement and measurement; channels like email, web, social, mobile, text, video and events; tactics like SEO, PPC, personalization, nurture and content; and tools like marketing automation, CRM, social media management, AI and predictive analytics. Since this discipline is so broad, some professionals invest in recruitment marketing tools & recruitment marketing automation solutions to help them do more with less time. Recruitment Marketers know how to tell the company’s story as a great place to work through all the right channels to reach their target audiences. They also need to measure the effectiveness of their recruitment marketing strategies and channels along the way. Recruitment Marketing is a relatively new position in Talent Acquisition, borrowing principles from Marketing, Recruiting and Recruitment Advertising. However, there are key differences. Recruitment Marketers have a different role than recruiters or sourcers, in that they are not directly responsible for filling jobs. Instead, they complement recruiters by telling the employer brand story and, as a result, generating more quality applicants for open reqs to help recruiters fill jobs faster and easier. They complement sourcers by building and nurturing a pipeline of interested candidates for sourcers to contact for jobs today and in the future. The role of Recruitment Marketing is at the front-end of the recruiting process, also called the pre-applicant stage, in which candidates become aware of an employer and consider applying for a job. Recruitment Marketing communicates the employer value proposition and promotes the company as an employer of choice through various marketing and advertising channels. The hand-off between Recruitment Marketing and Recruiting occurs when a lead becomes an applicant, in other words, when a job application is completed. From that point forward, the Recruiter screens applicants and manages the hiring process, working with the hiring manager through selection, interview, offer and acceptance. Is Recruitment Marketing a Practice, or Is It a Profession? It’s Both. As a practice, Recruitment Marketing is a core competency that’s become required of every recruiter. For example, recruiters use Recruitment Marketing skills to write keyword-rich job descriptions that generate better-fit applicants, create email subject lines that increase open rates, nurture relationships with silver medalists until the timing is right and connect with candidates over social media. How Do You Become a Recruitment Marketer? It’s not easy to find a list of available Recruitment Marketing jobs online. Recruitment Marketers are entering the profession primarily through two paths: from Recruiting and from Marketing. For companies that hire a dedicated Recruitment Marketer, most start out with one person in the role. Even the largest companies with dedicated Recruitment Marketers have small teams, as the discipline is still emerging. This is another reason why today’s recruiters must have Marketing skills to find and engage candidates. At some companies, the Marketing department provides Talent Acquisition with Recruitment Marketing support such as branding and design, career page management, social media management and content creation. Other companies invest in recruitment marketing services from a specialized Recruitment Marketing agency. All of these are valid ways to implement offline & online Recruitment Marketing in order to find and attract candidates in today’s competitive job market. As candidates become more digital, mobile and social in how they search for jobs and potential employers, the discipline of Recruitment Marketing will evolve to be as sophisticated as B2B and B2C Marketing. P.S. – Are you looking for recruitment marketing training? 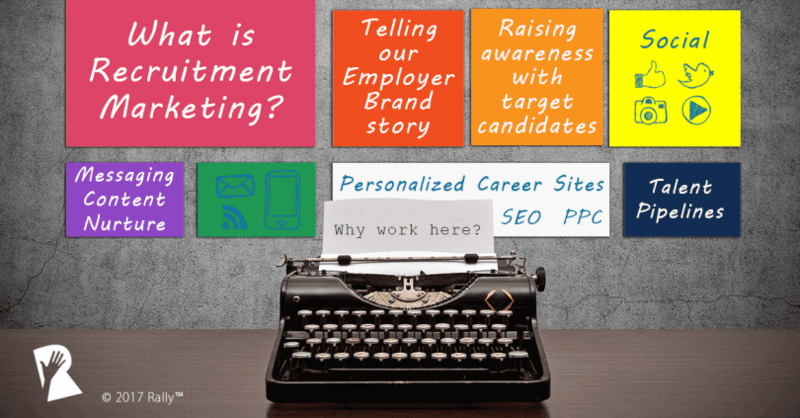 Do you want to stay up to speed on the latest recruitment marketing tactics? Or perhaps you just want to see some recruitment marketing examples straight from the field? If so, join the thousands of ambitious professionals in our free community.